Most people know there are different types of extinguishers available, and if you have received practical fire extinguisher training, you may have experienced the differences between a few of them. As well as the different coloured bands that wrap around the top of the extinguishers, there is a huge difference between each type, and they’re designed to do very different jobs. 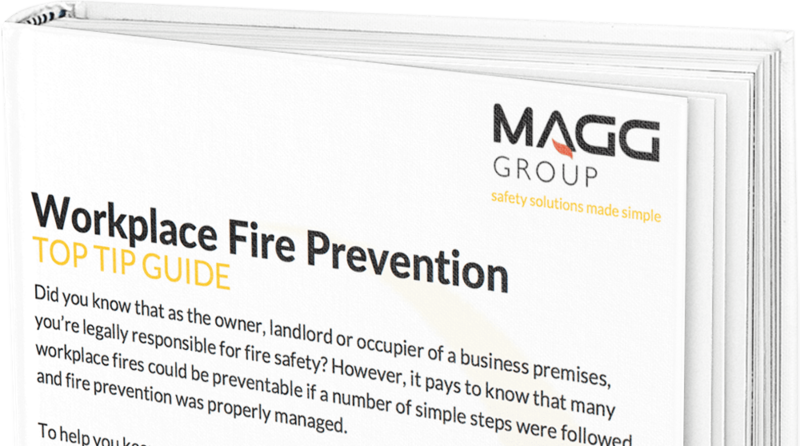 The type, size and location of extinguishers is to a large extent driven by the findings recorded in a business’s Fire Risk Assessment document. From that document a fire protection specialist can advise on the correct type of extinguisher for each specific hazard. So why are there different types of fire extinguisher? Surely a fire is basically a fire? There are many different classes of fire, we have different types of fire extinguisher because different materials fuel fires, and these materials react very differently depending on the method used to extinguish them. Class A Fire – Combustible Materials such as wood, paper, fabric etc. Class B fire – Flammable Liquid such as oil, gasoline and similar. Class C Fire – Flammable Gasses such as natural gas, propane, butane etc. Class D Fires – Flammable Metal Fires such as magnesium, titanium, etc. Electrical Fires – Any fire where electricity is involved. Water Extinguisher – Red body with a contrasting red band running around the top – These are best for fires involving organic solid materials such as wood, cloth coal etc, specifically Class A Fires. They are ineffective, and potentially dangerous for Class B, and Electrical Fires. These types of extinguisher work because water has a huge thermal absorption capability. When directed at the fire, the water lowers the temperature of the fire below the fuels ignition point, extinguishing the fire. These extinguishers can generally be used 2-3 meters away from the fire as they have sufficiently high pressure to deliver water at this distance. Water Spray Extinguisher – As above but instead of a ‘Jet’ type nozzle, has a spray type, with higher pressure. This causes the water to turn into a fine spray which has a considerably higher surface area of water hitting the fire, compared to normal water extinguishers. This makes extinguishing more efficient by more rapid extraction of heat. They can also contain surfactants which can help the water penetrate the surface of the material. As with standard water extinguishers, they are at best ineffective, at worst dangerous when used on Class B and electrical fires. Water mist extinguishers – Red body with a contrasting red band running around the top – These new extinguishers can effectively tackle Class A,B,C & F Fires. They work by producing an incredibly fine mist of water (around 22 billion droplets per litre of water) and will work on electrical fires up to 1kV (if you’re at least 1m away) as the water in the mist is deionised and the droplets are too small to conduct electrical current. The mist itself exits the extinguisher at supersonic speeds and is drawn to the fire which it cools and suffocates. The mist also forms a safety barrier between the user and the fire. Dry powder extinguisher – Red body with a blue band running around the top – These can be used on Class A,B,C but not F fires. They are safe to use on electrical equipment; however, they don’t penetrate the spaces inside equipment so the fire may reignite. This type of extinguisher also doesn’t cool the fire very well. Smouldering in deep seated fires such as in upholstery or bedding can cause the fire to flare up again. Dry powder extinguishers are not recommended for enclosed spaces as there is a danger of inhalation of the particles without sufficient airflow. They essentially work in a similar way to most extinguishers, by making the flames too cool for the chemical reaction to continue they reduce the temperature below the fuels ignition point. Some powders also provide a minor chemical inhibition, although this is relatively weak. They will effectively knock back the flame front, allowing people to escape but due to poor cooling properties may not keep the fire suppressed. Dry Powder (Special Powder) – Red body with a blue band running around the top – These are specialist extinguishers, designed to tackle fires involving combustible metals such as lithium, magnesium, sodium when in the form of swarf or powder. There are 3 types based on graphite, copper, or sodium chloride. They work by forming a crust which insulates the metal from other combustible materials and cuts off the oxygen supply. Their method of application is different from a standard extinguisher and specialist training is required. AFFF Foam – Red body with a cream band running around the top – These extinguishers work on Class A & B fires, but not Class F. These are mainly water based but use a foaming agent that floats on top of the burning liquid to break the interaction of the flames and the fuels surface. 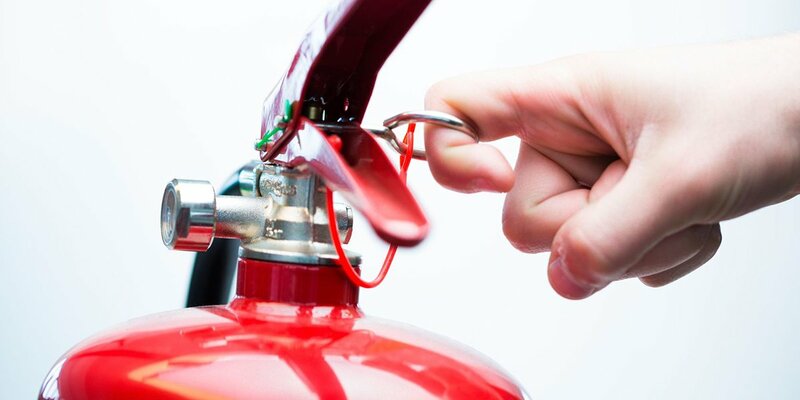 Dependent upon a properties specific Fire Risk Assessment, they are often used in place of water extinguishers. Carbon Dioxide – Red body with a black band running around the top – CO2 extinguishers as they are more commonly known are used on live electrical equipment fires. The extinguisher itself doesn’t cool the fire very well, they work by suffocation, the CO2 displacing the oxygen from the fire. There are some drawbacks with this type of extinguisher however. Since the CO2dissipates quickly in the atmosphere, there is a good chance without removing the source of ignition (in the case of an electrical fire for instance) the fire can reignite. 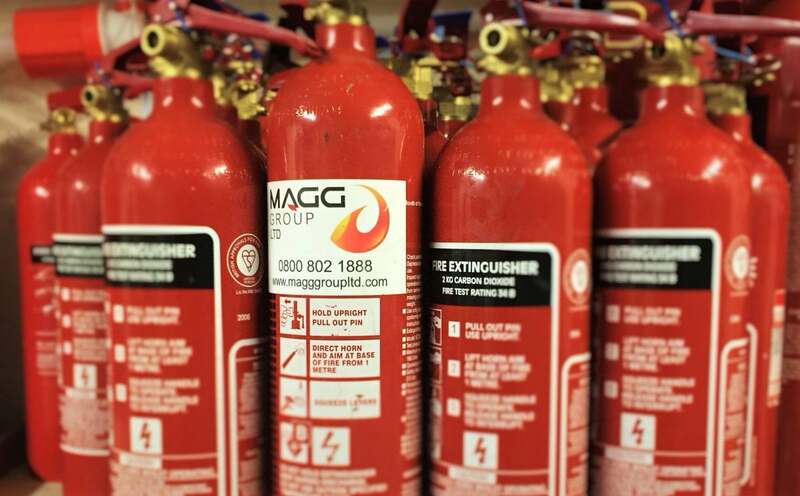 They also have a substantially shorter range than other types of extinguisher, generally a CO2 extinguisher will have an effective range of less than a metre. Of course, care must be taken not to asphyxiate people in small rooms due to the displacement of the Oxygen by CO2. Correct training to use CO2 extinguishers is vital as the rapid expansion of the gas upon discharge will cause the temperature of the nozzle and the base of the extinguisher to drop as low as -72 degrees, which can cause a cold burn to the user if handled incorrectly. Finally, Carbon Dioxide is also a greenhouse gas, making this the most environmentally unfriendly extinguisher. Wet Chemical – Red body with a yellow band running around the top- This type of extinguisher is specifically designed for Class F fires involving very high temperature cooking oils. They work because they contain a solution of potassium acetate, which as it gets sprayed out as a fine mist cools the flame front. Meanwhile the potassium salts start a chemical reaction, which forms a cake of soap like emulsion which cools the fire. They can be used on Class A fires but not on Class B,C,D and electrical fires.